The legendary author and adventurer was also somewhat of a lothario, famously whisking away any number of wives, girlfriends, and muses on romantic expeditions to Africa, France, Florida, and nearly everywhere in between. If you’re lucky enough to have someone you love in your life, it may be a good idea to take a page out of Hemingway’s book. What better possible present could one offer a significant other than a Valentine’s Day road trip? The scenic drives are inherently romantic, featuring cozy quarters, strange sights, good snacks, great music, even better company, and the chance to experience something completely different—together. Yet a few select routes stick out as some of the country’s most beautiful and romantic, making particularly dreamy backdrops for those who only have eyes for each other. You won’t quite be able to wrap this present or fit it in a box, but we guarantee your Valentine’s Day date won’t mind. 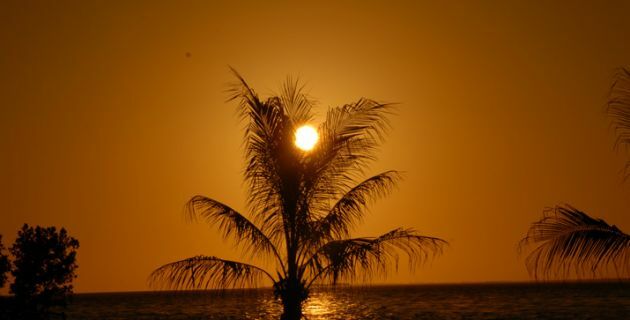 A picturesque sunset in Key Largo, Florida. If you’re feeling particularly inspired by Hemingway’s romantic views on life, love, and travel, you should check out the place that inspired him. The Hemingway Home—a gorgeous, two-story Spanish Colonial the author was lucky enough to live in for more than a decade—is located in the heart of Key West, at the end (or possibly the beginning, depending on your view) of Florida’s most famous route, the Overseas Highway. The 113-mile ribbon of road all but skims the crystal waters of the Straits of Florida, which sparkle brilliantly under a high and glorious equatorial sun. Along the way, it spans 42 bridges and hopscotches across a number of Florida’s most famous keys, including Key Largo, Marathon, and of course, Key West. Did we mention this scenic drive gets it start in the fabulous Miami? But what makes this a particularly romantic road trip? Probably just the endless opportunity for lazy beach days, cozy rainstorms, tranquil waters, gorgeous scenery, fresh food, delicious drinks, and inspiring architecture—of both the natural and man-made variety. If your partner doesn’t like this Valentine’s Day trip, well, you might want to find a new partner. 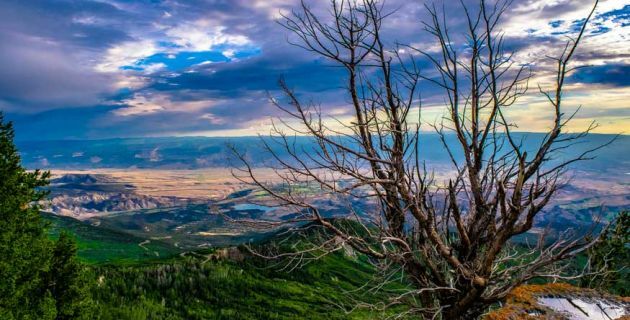 A stunning view of Grand Mesa, Colorado. If you and your other half are more mountain people, there may be no better place to go than Colorado. The Centennial State has its fair share of scenic journeys, but the 233-mile San Juan Skyway is especially dazzling, even in bitter cold February. Twisting its way through the heart of the San Juan Mountains, the circuitous “road to the sky” can be entered along several points, as it passes through the larger communities of Durango, Silverton, and Cortez. Travelers, however, will likely be much more interested in the mountain towns of Ouray and Telluride, famous for their sweeping vistas and cozy vibes. Of course, there’s also the natural areas the road traverses through, including the San Juan National Forest, Grand Mesa, Uncompahgre and Gunnison National Forests, all of which offer any number of opportunities to camp, ski, bike, hike, and generally enjoy the fresh air, great outdoors, and mutual sweat session with your sweetie. Plus, a portion of the road trip has been dubbed the “Million Dollar Highway,” technically for its expensive construction origins, but the name works equally well to describe the views along the way. A breathtaking look at the Sinkyone Wilderness down California’s “Lost Coast”. You’re a beach person, but your S.O. loves the mountains? Not a problem. 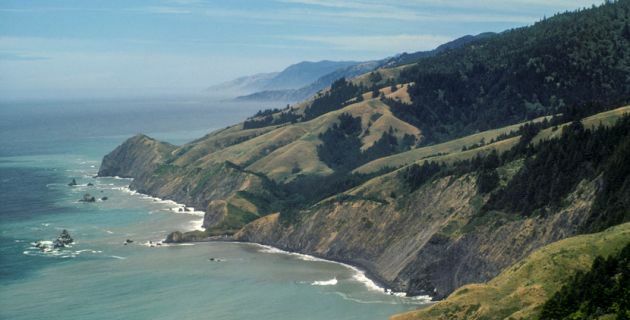 The breathtaking Lost Coast of California is sure to check everything off of everyone’s wish list. The rugged route is not for the faint of heart: Its roads are bumpy, full of sharp turns and sometimes unpaved; its beaches are buttressed by steep sandstone cliffs; and its trees would easily dwarf those cliffs and most near anything else you’ve ever seen. But that touch of wild side only makes the trip that much more romantic. As its name portends, there are plenty of places to get lost with your love along the way, whether you get swept up in the majesty of the Redwoods, find yourself along an all-but-abandoned beach near the Sinkyone wilderness, or snuggle up in one of the charming hamlets that dot the route. And as you traverse through Mendocino County— one of the country’s premiere locations for vineyards—you’ll find there’s no better place to share a bottle of wine. An epic love story such as yours truly deserves this epic route. The lovely town of Seneca Falls in Upstate New York. If you’re more interested in bucolic beauty, the Finger Lakes in Upstate New York make for an exceptional example. The region, in general, is huge, consisting of 11 finger-shaped lakes (carved out eons ago by glaciers), spread out across a 9,000-square-mile patch of gently rolling hills, fertile pastures, and coniferous forests. Its bountiful size leads to plenty of opportunities for road trips, but one particularly pretty way to go takes you on a scenic drive from Ithaca to Hammondsport. 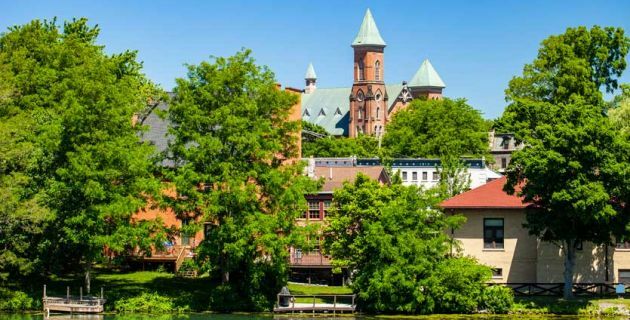 Home of Cornell University and Ithaca College, quirky Ithaca is known for its “gorge[ou]s” gorges and waterfalls, along with its funky downtown area stacked with plenty of cool restaurants and live music. You’ll land in Hammondsport, where you can stroll through the lovely downtown, take in the view at Lake Keuka, and enjoy an incredibly romantic Valentine’s Day. 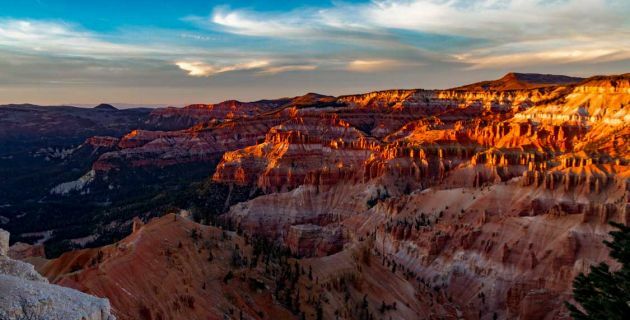 Cedar Breaks National Monument in Utah is host to many an awe-inspiring sight. If you’re looking for some true alone time with your paramour, you may want to consider a romantic road trip through the quiet and wonderful desert. There’s no place quite like Utah, and no road that conveys the state’s unique beauty quite like its Patchwork Parkway. It’s just 51 short miles, but it bursts with the brilliant oranges and reds of high desert canyons, the spiky silhouettes of pine and fir and spruce tree-dusted plateaus, and the dramatic expressions of the desert’s silt cliffs. Once regularly traversed by Native Americans and pioneers alike, the road—otherwise known as State Route 143—gains its nickname from the quilts those travelers would lay out on the snow to keep their feet warm in winter months. How romantic is that? With all the help of modern technology, you and your date can simply turn on your car’s heated seats as you pass any number of turnoffs that overlook the area’s lava fields, peaks, canyons, and lakes. Bonus points for spending the night at Cedar Breaks National Monument, where the 10,567-foot elevation and general remoteness add up to some of the best star gazing you could ever ask for—outside of the stars you get in your eyes when you gaze upon your honey.